We hit the river around 1:00 in the afternoon this past Saturday, with a three hour drive in the rearview mirror and the various necessities of late winter fly fishing – the waders and the synthetic long johns and the fleece pants and the heavy wool socks and the Nano-Puff jackets—all in place. It didn’t matter. While the air temperature was decent, the water was down in the mid-30s and wading conditions that were unremarkable for a grown man were bone-achingly, foot-numbingly cold for a 9 year old boy with no body mass to speak of and the fat reserves of your typical anorexic super model. We slid down the muddy brown bank of the side channel, stepped into the Missouri, and picked our way slowly across the current on a gravel bar, his hand in mine, both of us holding tight, knowing that if he went in the river, even here in the shallows, he’d be hypothermic before I could get him back to the truck. You don’t mess around with frigid water. You play it safe; at least if you’re smart. We crossed over toward the far bank and there, in a shallow eddy bordered on the far side by last night’s skim ice and on the near side by the main current, the midges were on parade. They rolled around on the river, blown not so much by a nonexistent breeze as by the vagaries of fate and the whims of their tiny, ever-beating insect wings. It was the mad dash of life; chaotic; unpredictable; swirling; as if vast numbers of those little bugs were engaged in some quasi-natural version of bumper cars, or as if they were the individual motes in a two dimensional dust devil, pressed inexorably down onto the water’s placid surface by the weight of our gray Montana skies. Downstream by 30 feet, in the mix zone where the eddy came back together with the channel’s main current, a big trout rolled on the surface, showing first his dorsal and then, just to grab our attention, a tail as wide as my hand. On the seventh cast, something beneath the surface sucked in the tiny soft-hackle he was swinging across the eddy and I told him to lift the rod; that he had a fish. He must not have seen the line pause—there was a second of hesitation while he wondered if I was kidding—and then the line came taut and the trout moved off and I told him the same thing I always tell him. 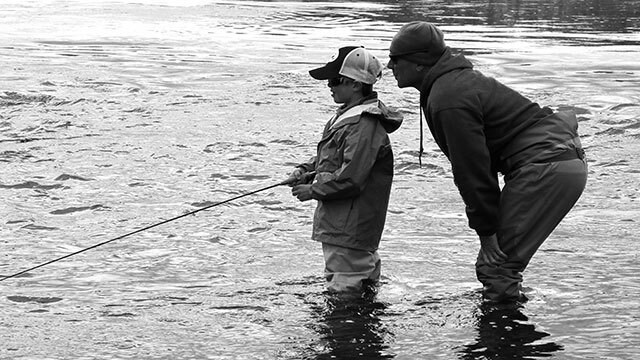 Get the rod tip up, and keep the line tight and, if the fish wants to run, let him run. And if he doesn’t run, then it’s time to reel. It took a couple minutes, but a fish he probably wouldn’t have landed if the river temps had been a little warmer finally came to hand, and Kian reached down, stuck his fingers in the ice-water and touched her side. We both marveled at twenty inches of gorgeous wild rainbow, just as fat as you could ever imagine, and solid, and sculpted from pure, incandescent, unadulterated Missouri River magic. He touched her, and I slid the tiny hook from her jaw with my forceps, and she disappeared back into the water without ever having left the river that gives her life. Then we waded back across to the bank, where my boy, my son, was no longer merely frozen, but frozen and joyful and incredibly alive. There are days when an invisible light shines down and all you can do is lower your head and give thanks; when the blessings so far outnumber the burdens that you touch your hand to your heart and the whole world seems to smile. He turns 10 on Saturday, this boy of mine, and we live next to the mountains and under the Big Sky. What have I done to deserve gifts like these? Note: This piece was written a couple of years ago. Kian is now about to turn 12.